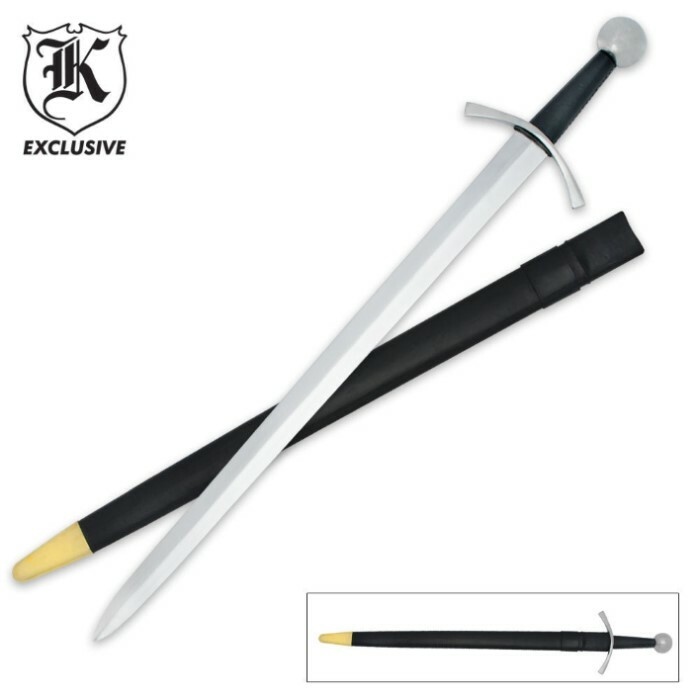 The Final Crusade Sword With Leather Scabbard | BUDK.com - Knives & Swords At The Lowest Prices! This Final Crusade Sword is the perfect piece to add to your Medieval weapon collection! This sword features a 29 1/2” high carbon steel blade with a metal handguard and pommel. The leather handle provides an excellent grip. Includes leather scabbard with belt loop. Note: the tip of the scabbard may vary slightly in color. A good, sturdy sword. It's weight and size are perfect (at least for me). In the picture, the bottom of the scabbard is gold, but it is actually silver. The guard is a little loose. The pommel is so big that it overpowers the look of the sword a little bit. Overall though it is a very satisfactory sword. For all you Crusades lovers, it is a must have. If you want a sword to carry and wield this sword is balanced much better than the more decorative swords. I'm buying this for a knights costume and didn't want a real blade heavy sword. Its simple buy could easily be used in combat without much muscle.